(Chicago, IL) — Packer Schopf Gallery is pleased to present Foreign Bodies, a solo exhibition of large-scale anatomical drawings by Chicago-based artist Vesna Jovanovic. 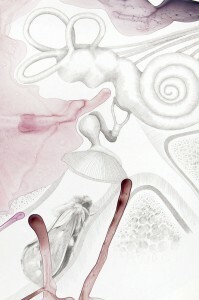 These giant drawings on Yupo hang like scrolls and depict objects that have entered the body accidentally and intentionally, surgically and aesthetically: a moth enters an ear canal, surgical screws hold together a hip bone, batteries float along a stomach lining, and a breast implant hovers behind mammary tissue. In this new body of work, Jovanovic continues to use chaotically splashed ink with meticulous cross-hatching in pencil. Influenced by phenomenology and medical ontology, and using scientific illustration as a point of departure, Jovanovic opens up the corporeal threshold to investigate what it means for something to be situated in the body, whether foreign or familiar. With an additional background in science, Jovanovic worked in research laboratories early in her career. This is her second solo exhibition with Packer Schopf Gallery. About the Gallery: In September 2006, Aron Packer joined forces with William Schopf to open Packer Schopf Gallery in the thriving West Loop gallery district in Chicago. Over the years the gallery focus has shifted from folk art to contemporary art, curating compelling work that is both a little obscure and idiosyncratic. About the Artist: Vesna Jovanovic is the current artist in residence at the International Museum of Surgical Science. Her work has been widely exhibited and can be found in collections in the Chicago area and beyond. Images of her work have been featured in Science News and Time Out Chicago; and on numerous blogs including Discover Magazine; Seed Magazine; and Art:21. Naturally Hypernatural: Visions of Nature, Interdisciplinary Conference. Naturally Hypernatural: Visions of Nature is an interdisciplinary conference investigating the fluctuating “essences” of “nature” and the “natural” in the 21st century. Each of these terms carries with it an enormity of philosophical questions ranging from the alteration of life itself to dialogues concerning the notion of the Anthropocene, a term used to describe man’s intervention into the natural world. The talks presented here will focus on contemporary issues in the visual arts as they intersect with the biological and geological sciences, confirming that nature remains an intrinsically mysterious, ever more mutable entity. At the present time, cellular parts are being remixed in laboratories to create synthetic organisms while geological transformations are forecasting wild swings in weather conditions. Human reproduction regularly occurs in Petri dishes while cucumbers are grown in space. The artificial and the natural now combine to form novel entities, never before seen on earth, while animal species dwindle down to extinction every day. Animals and plants are exhibited as contemporary art, while the real is conflated with the imaginary. Technological advances and their theoretical undertones have migrated into art practice producing New Media installations, Bio Art exhibitions and a global community of art practitioners adapting novel productions to cultural resources. 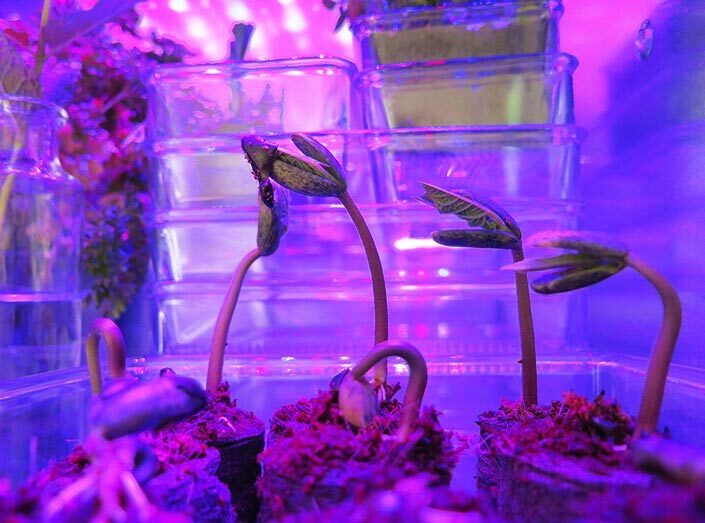 In addition, visual art has become a social practice platform with projects that intersect with urban farming, DIY biology and extremes in performance art. Naturally Hypernatural: Visions of Nature brings together artists, historians, curators, philosophers and scientists to examine and comment on these ideas. In addition, there will be an exhibition of work by students, alumni and faculty, generated through SVA’s Bio Art Laboratory, the first of its kind in the U.S.A.
Suzanne Anker, Astroculture (Shelf Life), 2011/2014. Installation view at [macro]biologies II: organisms, Art Laboratory, Berlin.